J.K. Rowling’s Harry Potter wasn’t the only one privy to the Philosopher’s Stone. But this isn’t about Hogwarts magic or discrediting J.K. Rowling at all. In 1669, a German merchant who was considered as an amateur alchemist at the time tried to get to that famed stone first, not by magic of course, but by science and experiment. In his attempt to create an object that could turn metals into pure gold, Hennig Brand heated boiled urine which resulted in a liquid bursting out into flames, producing what we now know as phosphorus, for the very first time. Whether or not it was what he thought of when he was imagining his Philosopher’s Stone, that experiment eventually paved way for the discovery of the other first elements in Science, in the early 1800s. The development of the Periodic Table then followed, with Russian chemist Dimitri Mendeleev arranging the elements by order of atomic mass, and was largely credited for it in its history. It was some 200 years in the making. But let’s not forget that we sure have come a long way since listing and counting only earth, wind and fire as the elements existing. 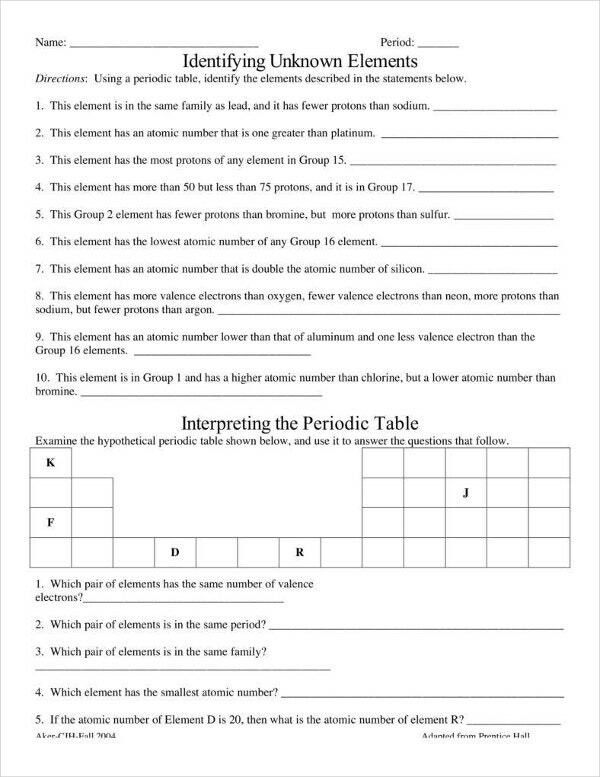 You may also like best worksheet templates. A Periodic Table defined is a horizontal arrangement comprising of all the chemical elements that are present in the order of their atomic number, electronic configuration, and persisting chemical properties. The ordering of these elements is representative of patterns where one column comprises metals to the left of the table and nonmetals being on the right side. The rows in the table are called groups and the rows are known to be periods. 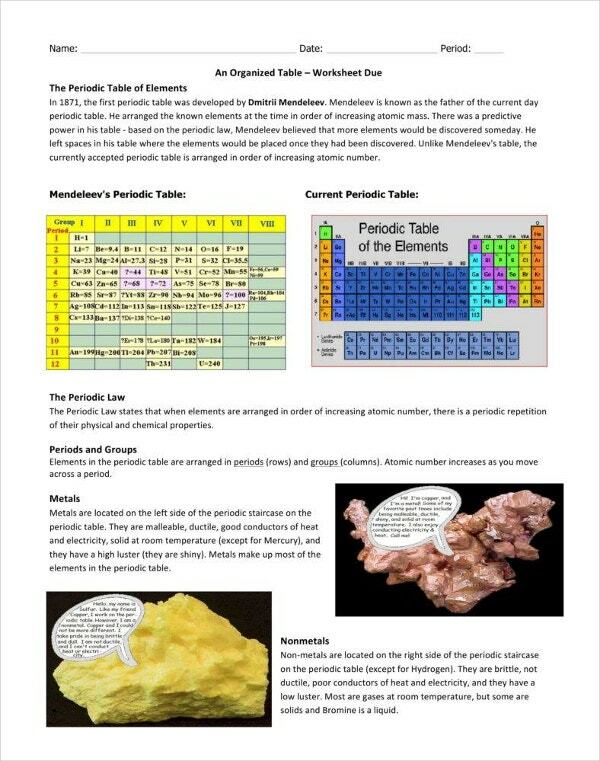 This was created to highlight the periodic trends in the elements’ existing properties. 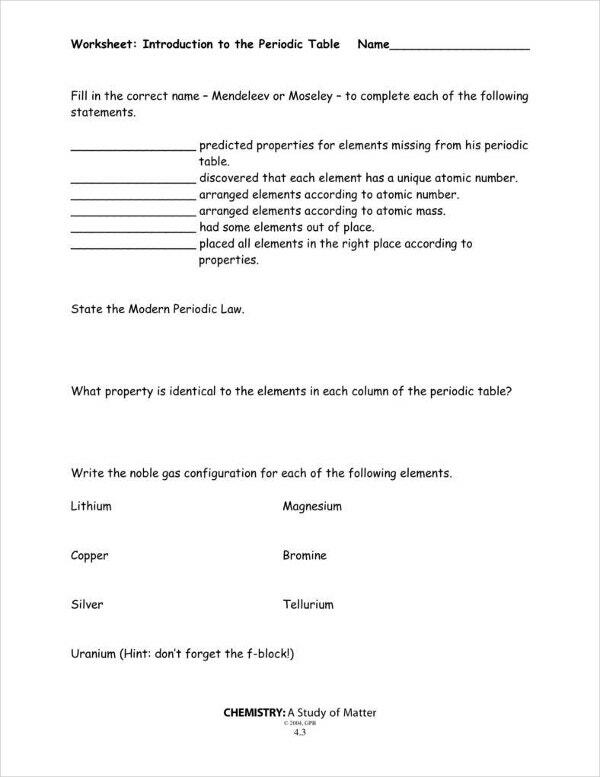 The table is also useful in knowing the connections between different properties of elements and also to predict the properties of those that are not yet detected. Anyone who is in the academe or anyone generally interested in various fields in chemistry and science will be able to find its application to be largely helpful. Every chemical element is made up of a specific atomic figure showing a number of protons existing within the nucleus. Most of the elements are isotopes. They are then grouped under one element, and should never be separated in the table. As of 2016, the table is comprised of 118 parts and counting. You may also see daily worksheet templates. Six atoms may seem such a small number with little significance, especially if they are there for only fractions of a second and disappear or break instantly after, however, the impact can be really huge. The announcement that Russian and American scientists a few years ago were finally able to produce a minute part of element 117 through firing calcium atoms which are element 20, at berkelium which is element 97, is occupying a place missing on the periodic table. 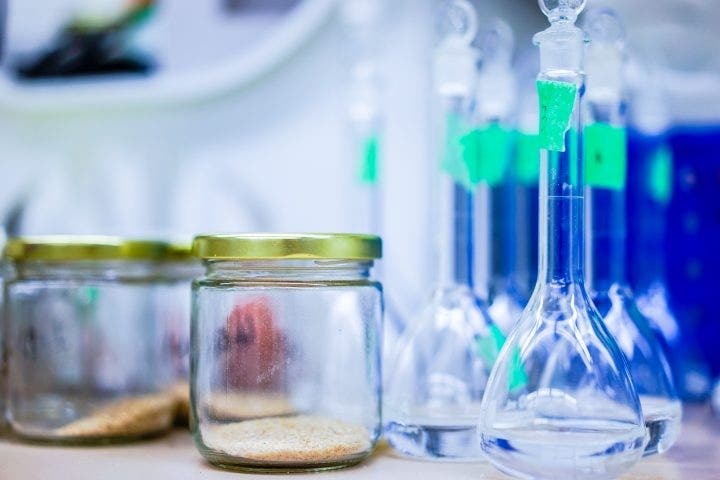 With the results being confirmed, the rest of the chemistry field will have “ununseptium” as a more elite moniker, filling the spot between 116 and 118 which, to nobody’s surprise, are also elements waiting to be named and identified by the International Union of Pure and Applied Chemistry. You may also like event planning worksheet templates. In this case, like most of those after element 92, which is uranium, “ununseptium” counts as artificial and not necessarily legit. This latest explanation backs the idea that while unproven and yet to be discovered stable elements exist somewhere. No one, not even the best people in modern science, can tell for sure if there is ever going to be an endpoint to the table and have it existing as it is, without gaps, once and for all, or if the latest elements as artificially engineered additions will make it grow even further. By the time science reaches another massive breakthrough, we would probably end up with a periodic table as complex and big as the world map. Overreaction aside, the question of how much bigger the already 141-year-old table we have today can get is anything but elementary. You may also like vocabulary worksheet templates. Before Mendeleev, the earliest attempt in the classification of elements was in 1789 when Antoine Lavoisier grouped the elements based on their properties into gases, non-metals, metals, and earth. Another scientist by the name of Johann Döbereiner was able to recognize groups of 3 elements in 1829, having similar chemical properties, such as lithium, sodium, and potassium. He was able to see that it showed the properties of the middle element could be predicted as to the properties of the other two. Since Mendeleev, there have been some changes to the modern Periodic Table, thus requiring a chart for modern elements whose rows and columns coincide with their properties and how they relate with each other, what with all their complexities. Back in the 19th Century, different scientists were already working to develop the traditional periodic table with elements according to their atomic weight. After Lavoisier, over the next decades, many other different attempts were made in the goal to group elements together. None was as successful in finalizing it than Mendeleev, organizing the 63 elements that were already discovered by other scientists, with the first one dating as far back as the Middle Ages. In 1869, the first real table was created. Mendeleev also left some spaces blank for the existence of other elements he cannot yet prove. Then came physicist Henry Moseley, whose experiments in 1913 proved the definite order of the elements being based on the atomic number instead of atomic weight, ergo, the number of protons inside an atom’s nucleus. You may also like printable worksheets. We know now that even before the discovery of naturally existing elements, the periodic table was used to foresee the chemical and physical properties of elements in the gaping squares on the table, even though whatever new elements we have are all found to be extremely radioactive, breaking them down quickly into elements that are more familiar. You may also see printable budget worksheets. 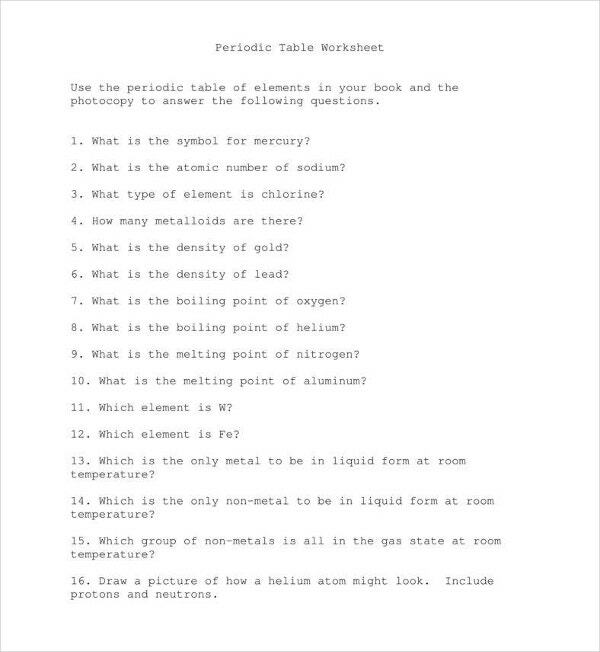 The table is useful not only for students in high school or college taking their chemistry classes. It also helps scientists in predicting all types of chemical reactions happening inside an element. The table offers a definite picture of the facts and figures of every element rather than having to memorize it. One look and studying its structure beforehand will tell you about the element’s chemical reactivity, for example, whether it conducts electricity, soft or hard, along with its other characteristics. 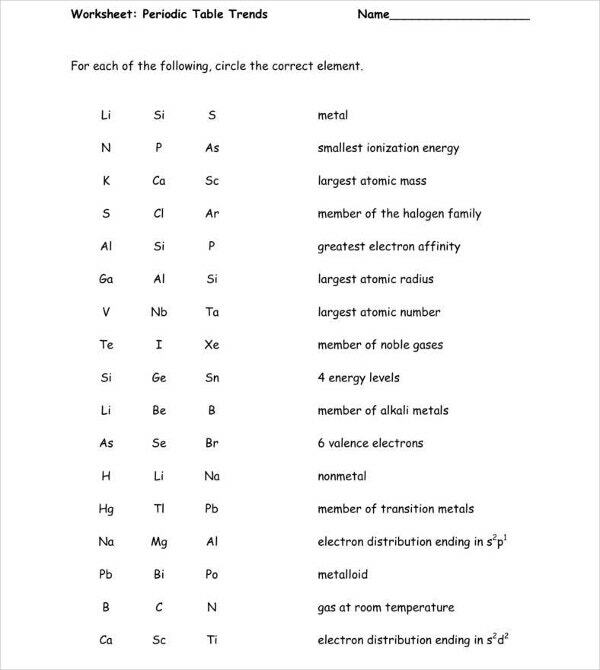 If you haven’t already noticed, the elements are grouped according to their families and periods with vertical and horizontal rows, respectively. In each family or period, the elements have similar or opposite characteristics. This means that the table makes for a quick reference as to how the elements interact and which elements react in the same ways chemically. It also helps you identify which ones have the same weights or atomic structures. You may also like fun math worksheet templates. 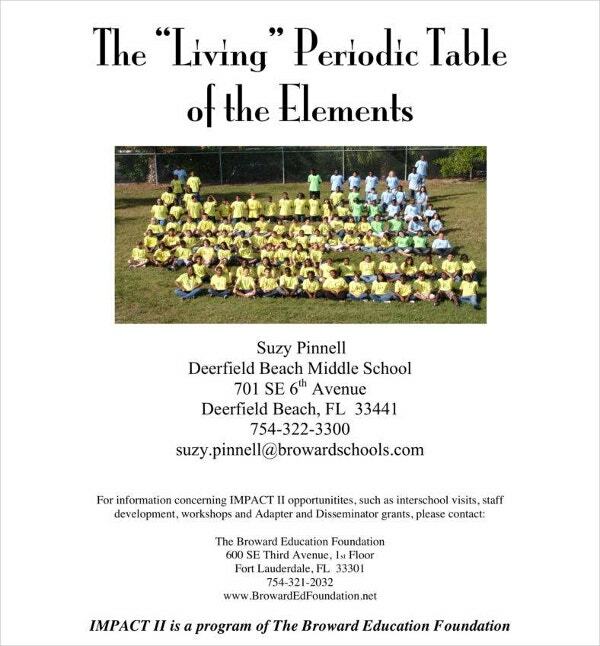 The Periodic Table has information that is valuable to scientists. Things such as the similarities of elements and atomic weight may be nothing particularly important to a regular person but it helps scientists determine how to put them together based on atomic particles and how they are going to behave. When the scientist finally get hold of that type of data, it gets applied to the experiments and the research or experiment then moves forward, even if what the scientist is working on, is something as simple and mundane as mixing hydrogen with oxygen to produce water, or they can choose to take it one step further by trying to end up with a hydrogen bomb, whichever proves to hold weight for validation. You may also see money math worksheet templates. The periodic table of the elements defines and shows the atomic structure of all elements that are currently known to mankind. Through the periodic table, a person will have the ability to tell the number of electrons in an element and how much it weighs, thereby avoiding being misinformed about a matter, since he will be able to check the atomic structure, compare it to what he finds in the table, and identify it accordingly. This is because no two elements are ever the same. They have different properties and each has its own separate set of information. matching other materials of the element with the ones you find on the table, helps in validating what you find out. 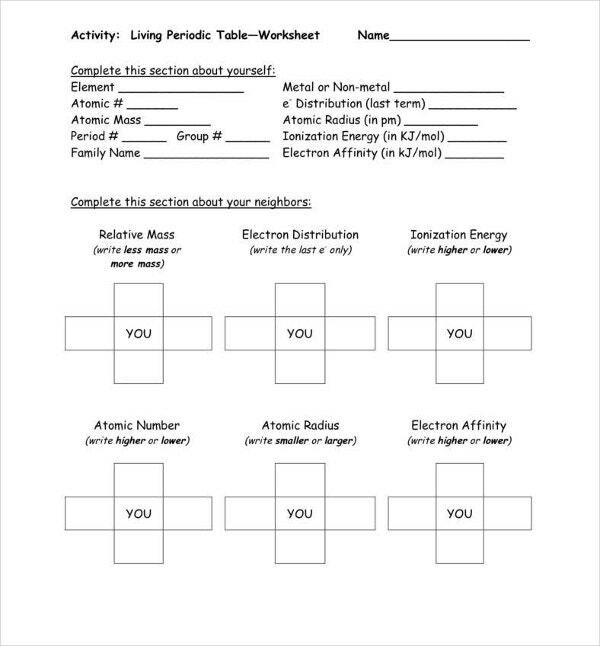 You may also see free worksheet templates. Chemists and all of science can use what information currently exists in the periodic table to determine whether the elements have been messed or tampered with in some way, good or bad. For example, if they understand that there is a specific number of neutrons as something that makes up the basic element, then there may have been some sort of change that happened with an atom having the same protons count but different neutrons figure than the base element. It could mean another discovery. They may not be able to prove just what caused it and how, but they know something is up for sure. This is what counts as historical perspective or value when they can prove everything later on. 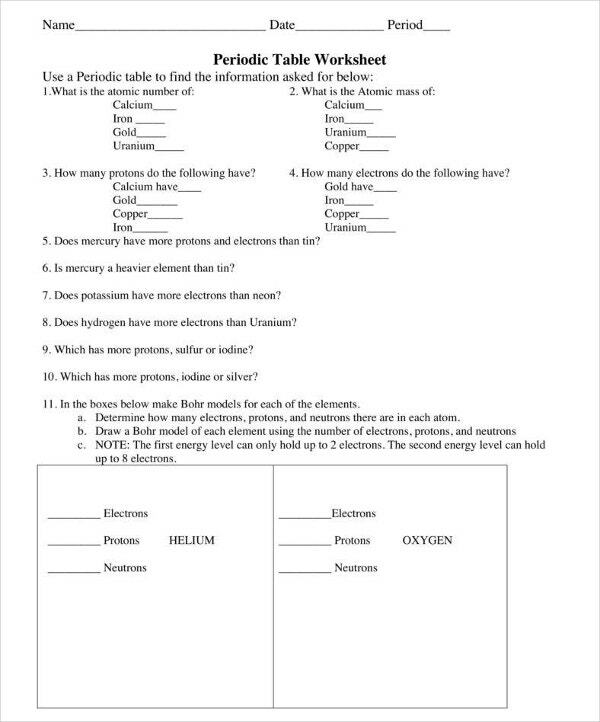 You may also see review worksheets. The periodic table is one of the most significant discoveries science has ever produced, capturing and validating the importance of various fields in science, like biology and physics, and not only limiting its achievements in the application of chemistry. It is something definitely unique, allowing past, present and future scientists to predict the appearance and properties of matter existing on Earth and the universe beyond. You may also see Venn diagram worksheet templates.